Does It Build Understanding or Create Distortions? moderated by Dr. Carlos Cortes. Please register but you may pay at the door. Author: The Children Are Watching: How the Media Teach About Diversity. Currently he is on the summer faculty of the Harvard Institutes for Higher Education, the faculty of the Summer Institute for Intercultural Communication, and adjunct faculty member of the Federal Executive Institute. 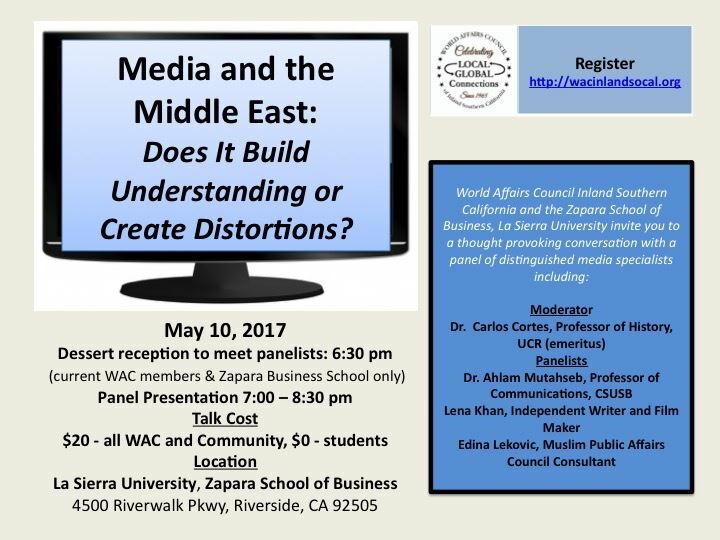 Dr. Ahlam Muhtaseb, Professor of Communication Studies, CSUSB. Co-Director "1948: Creation and Catastrophe, " documentary film on the founding of Israel from multiple perspectives. Before completing her Ph.D., Ms Muhtaseb served as Information Officer for The British Council East Jerusalem and Public Relations Director for the Hebron Mayor's Office. Lena Khan, American writer & film director. She has worked extensively directing short films, commercials, and music. Her first feature film "The Tiger Hunter" will be released this fall. Ms Khan recently received Sony Entertainment Television's South Asia Excellence Award for her work. Edina Lekovik, Muslim Public Affairs Council media outreach consultant, co-founder of Muslim-Jewish Partnership for Change, member of LA Mayor Eric Garcetti's Interfaith Leader's Collaborative. Ms Lekovik was named one of the 500 most influential Muslims in the world by Georgetown University Royal Islamic Strategic Studies Center.